The scenario is like a baseball batter watching an oncoming fastball. Although Andromeda is approaching us more than 2,000 times faster than a fastball, it will take 4 billion years before the strike. Computer simulations derived from Hubble's data show that it will take an additional two billion years after the encounter for the interacting galaxies to completely merge under the tug of gravity and reshape into a single elliptical galaxy similar to the kind commonly seen in the local universe. 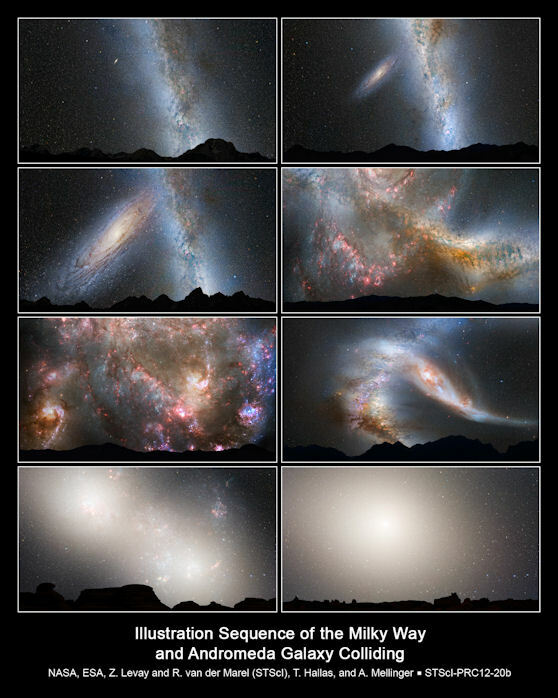 This series of photo illustrations shows the predicted merger between the Milky Way and Andromeda as seen from Earth. The first frame is the present day; the last frame is 7 billion years from now. A computer animation of the Milky Way - Andromeda collision. "This was accomplished by repeatedly observing select regions of the galaxy over a five- to seven-year period," says Jay Anderson of STScI. 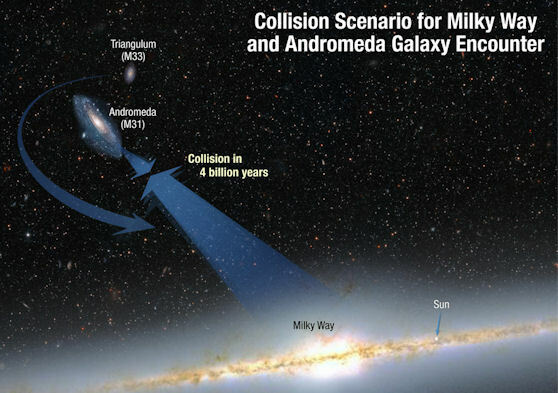 "In the worst-case-scenario simulation, M31 slams into the Milky Way head-on and the stars are all scattered into different orbits," adds Gurtina Besla of Columbia University in New York, N.Y. "The stellar populations of both galaxies are jostled, and the Milky Way loses its flattened pancake shape with most of the stars on nearly circular orbits. The galaxies' cores merge, and the stars settle into randomized orbits to create an elliptical-shaped galaxy."